With so much information out there, it can be difficult for parents to figure out the best way to keep kids safe in the car and parents often wonder if they are making the right choice. When it comes to choosing a car seat for your child there is no single number – age, height, or weight – to determine the best option. Kids come in all shapes and sizes with different personalities and levels of maturity. What might make sense for one child may not be the best choice for another, even if they are the same age or size. In general, the following guidelines will help you make sure your kids are riding safely in the car. If you have questions or if you need help installing and using your car seat or booster seat, visit a Permanent Car Seat Checking Station in your community. The restraint must be correctly installed in the vehicle according to the child restraint and vehicle manufacturers’ instructions. Use rear-facing child restraints – either a rear-facing-only seat or convertible seat – for children until at least 2 years of age or until they reach the maximum height and weight allowed by the car seat manufacturer. Most rear-facing child restraints available today can accommodate children rear-facing up to 30 pounds or more (depending on the model). 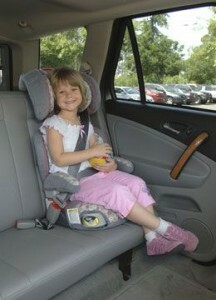 For optimal protection children should remain rear-facing as long as possible. For optimal protection children should remain rear-facing until they reach the maximum height or weight limit allowed by the car seat manufacturer. 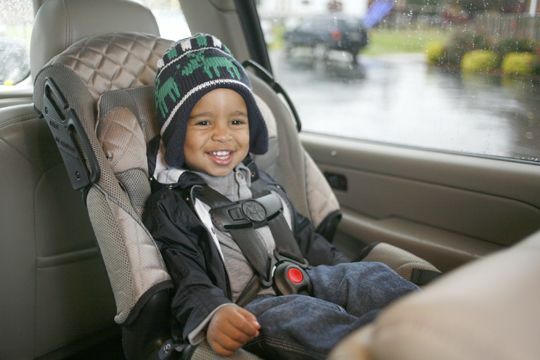 When children outgrow their rear-facing seats (by weight or height, whichever comes first), they should ride in forward-facing car seats with harnesses until they reach the upper weight or height limit of the seat. The upper limits can range from 40 to 90 pounds, depending on the model. Resist the temptation to put a large but young – and behaviorally immature child – into a booster seat. 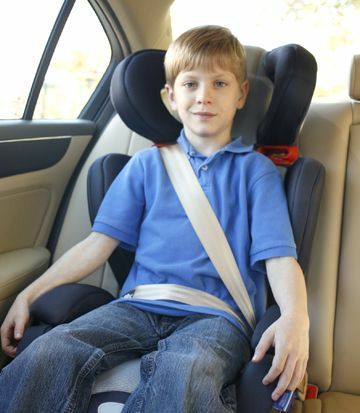 Instead, consider a combination seat with a higher upper weight limit (also called a harnessed booster seat) that has a harness that can be removed when the child is mature enough for a booster seat. 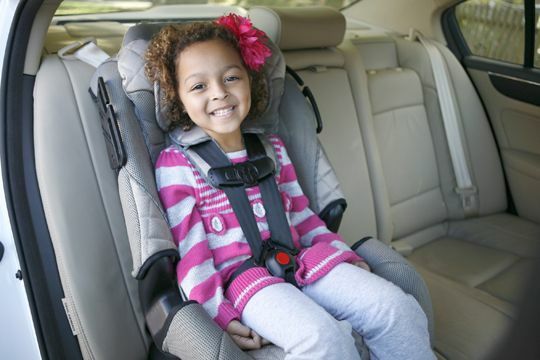 Once the forward-facing harness is out grown by height or weight and the child is mature enough to leave the seat belt properly positioned on them in the booster seat, children should use a belt-positioning booster seat until the lap and shoulder belts fit properly on their own. Visit this page for more information on how to determine if the seatbelt fits properly. 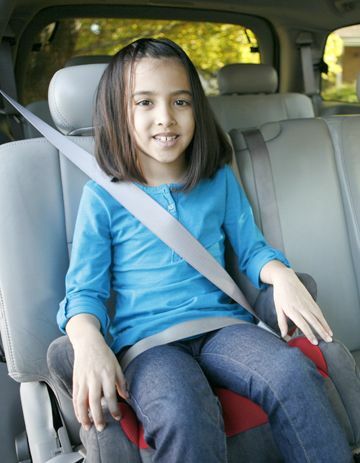 Children should continue using a belt-positioning booster seat until the vehicle’s lap and shoulder belt fits correctly on its own. For most kids, this won’t be until they are between 8 and 12 years old. A properly fitted lap belt fits low and snug across the hips and should be at least touching the upper thighs. A properly fitted shoulder belt is positioned across the collar bone and chest. Visit this page for more information on how to determine if the seatbelt fits properly. Note that NC law does not allow the use of just the seat belt until the child is at least age eight or at least 80 pounds even if it looks like the seat belt fits. The following are general guidelines. Consult your car seat owner’s manual for instructions specific to your seat. Position the harness at or below the shoulders for a rear-facing car seat. Position the harness at or above the shoulders for a forward-facing car seat. Some convertible car seats require that the top position always be used when the seat is forward facing. Always consult your car seat owner’s manual to determine the correct harness position for your car seat. A snug harness is important for good crash protection, but it should not cause discomfort to the child. To determine if the harness is snug enough, tighten the straps using the harness adjustment mechanism on the seat. Then, try to grab a pinch of harness at the child’s collarbone/shoulder area. If you can pinch up some of the harness, it is too loose. Continue to tighten the harness until you can no longer pinch any of the harness straps. On many seats, extra harness slack can gather in the hip area. Be sure to remove all this slack before checking for tightness. Once the harness is adjusted, position the harness clip at armpit level. This clip is designed to hold the harness straps in place on the child’s shoulders. Position the chest clip at armpit level. In a rear facing seat, most manufacturer’s allow you to use a rolled diaper or washcloth to take up space between the baby and the crotch strap to prevent slouching. Similarly, you can add rolled up receiving blankets to the sides of the seat in order to position an infant. These should be added after the child has already been buckled into the seat. Never put anything behind the child’s head or body that was not provided by the car seat manufacturer specifically for that purpose. 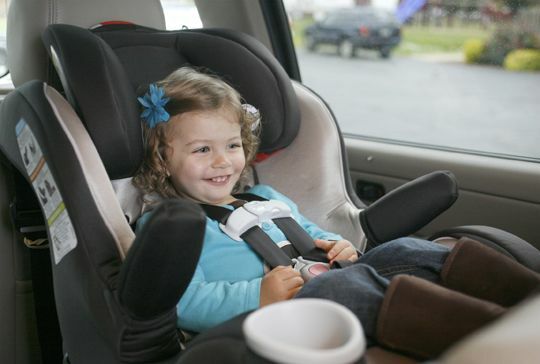 Booster seats are designed to lift the child up so that the adult seat belts fit properly. A properly fitted lap belt fits low and snug across the hips and should be at least touching the upper thighs. A properly fitted shoulder belt falls across the collar bone and chest. 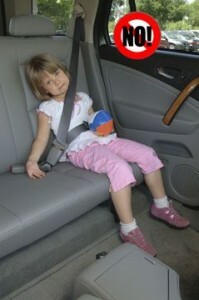 Left: Child is too small to use the seatbelt alone. Right: With the booster seat the lap and shoulder belts are correctly positioned. Make sure your child is wearing clothes that allow for a proper fit of the harness. Thick puffy coats and other bulky clothes can affect how the harness fits on the child and may interfere with how the harness works. In cold weather, either dress your child in non-bulky clothes such as a fleece jacket or remove any puffy jackets prior to buckling your child into the car seat. 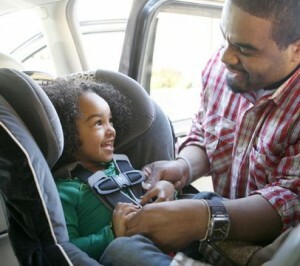 Keep a blanket in the car and tuck it around the child once the harness has been fastened and adjusted. 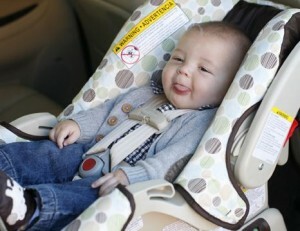 To do its job, a child restraint must be installed correctly in the vehicle. Always read the installation instructions that come with the child restraint AND read the section on seat belts and car seats in your vehicle owner’s manual. Before each trip, check to make sure the car seat is securely installed. All car seats have different installation instructions so it is important that you follow the instructions that came with your seat. Is installed facing the correct direction for the age and size of the child – children need to ride rear facing until at least age 2. Longer is better as long as the child is within the height and weight limits for the seat. Is installed at the recline angle allowed by the manufacturer – refer to the car seat’s instructions and recline angle indicators (if so equipped). Is installed in the rear seat – the center rear seat is generally considered to be the safest seat in a car because it is the farthest seat from any potential impact, but the side seats also provide good protection and may make it easier to get the child in and out of the car. Is installed tightly such that there is less than 1 inch of movement side to side and front to back when checked at the base of the seat at the belt path (where the seat belt or LATCH attachments are located). If you have questions about your installation, contact the car seat manufacturer or visit one of our local Permanent Checking Stations to make sure your seat is installed correctly and that the seat belts being used by older children fit correctly.